Acupressure has emerged as one of the most successfully practiced alternative medicines for various ailments. 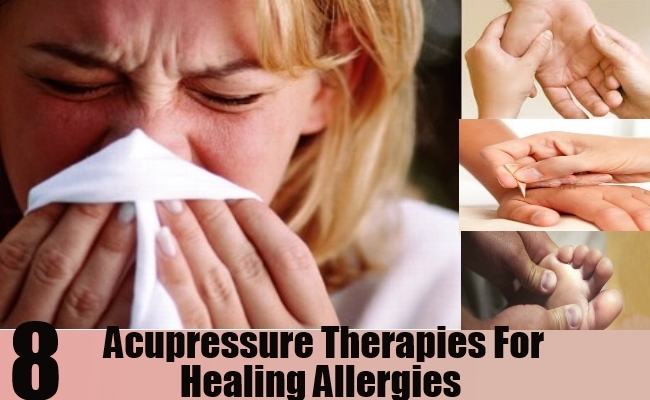 Likewise, use of acupressure for allergies is also gaining ground.Before we get involved into the various acupressure therapies for curing allergies, it is essential that we understand the philosophy of acupressure. The art of Acupressure is almost two thousand years old and is one of the primary forms of traditional Chinese treatments. Chinese traditional medicines believe that the healthy upkeep of the body depends on the alignment of the three elements of the body-Yi, Yang and Qi.There are some important pressure points in the various parts of our body that stimulate the flow of internal energy and align the above mentioned three elements. On the basis of the kind of ailment, acupressure is applied on the specific pressure points. This point is placed in the hollow region just underneath the collarbone and adjacent to the location of the breastbone. Acupressure, applied on this point, relieves symptoms of allergies like chest congestion, asthma, breathing difficulties, coughing and also sore throats. This point is located on the outer end, at the top of the crease of the elbow. The symptoms of allergy that it works on include inflamed skin disorders, rashes and hives, fever and itching. This point is located just below our belly button at approximately 2 finger widths. The symptoms of allergy that this point works on are gas, constipation, fatigue, insomnia and general weakness. This point is located underneath the kneecap at approximately four finger widths, positioned outside f the leg. The point serves to cure allergic symptoms on a whole. It stimulates the flow of internal energy to the organs that have got severely affected because of allergy. Acupressure on this point increases the resistance power of the body. This point is located at the top portion of the foot, in between the valley of the second toe and the big toe. The point specifically helps to cure symptoms of allergy like bloodshot eyes, reactions of the skin and other neuromuscular disorders. Located at the base of our skull, the point is acted on to cure symptoms of headache, exhaustion and swollen eyes. This point is located at the upper region of our forearm. It strengthens the immune system of our body. Located in the webs of the index fingers and thumb, it cures symptoms like headaches, sneezing and hay fever. To obtain maximum benefit from acupressure for allergies, thorough knowledge of the above mentioned points and also the corresponding symptoms that they are associated with are essential. While the process of acupressure is very simple and can be done at home, professional guidance will ensure greater benefits.